Seedstars World, the biggest seed stage startup competition for emerging markets is coming back to Africa to scout for the top high growth startups and entrepreneurs and accelerate them on their path to global success. On this 2017 edition of the tour, they will visit over 25 cities across Sub-Saharan Africa to host bootcamps and pitch competitions, adding countries such as Cameroon, Democratic Republic of Congo and Zambia to its tour. The winner from each country is invited to the final at the Seedstars Global Summit in Switzerland to compete for up to $500,000 in equity investment and additional multiple prizes and perks. Step 1: Make sure you have a venture profile published on the VC4Africa platform with your most recent pitch deck attached. 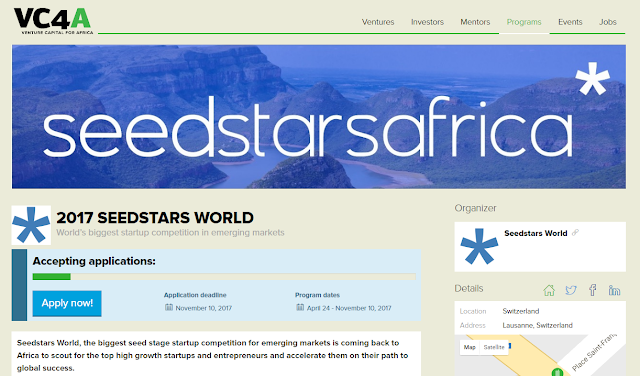 Step 2: Apply to one of the 15 local events in Africa through the online form. At each Local Event, up to 10 pre-selected startups are invited to pitch in front of an expert jury and quality audience to determine the winner. The event brings together key entrepreneurs, investors, corporates and institutions from the local ecosystem combined with a unique global Seedstars World flavour. The winner of each Local Event gets a free trip to Seedstars World Regional Summit and the Global summit in Switzerland, with a chance to win up to 500,000 USD and other amazing tech prizes. The winner of each Local Event will be invited to Switzerland to represent his startup and country at the global finals. The Final Event is a weeklong adventure consisting of a bootcamp, international conference and investor forum. It’s an amazing chance to meet with investors, build a global network and grow your business. And don’t forget there is up to USD 500,000 mn in equity investment on offer to the winning startup and additional money prizes! There is a prize package consisting of up to $ 500,000 in equity investment and more in cash and in-kind prizes. You’ll be exposed to VCs, corporates and angels searching for investment opportunities. All Seedstars World events are heavily covered by local and international press with around 1000 articles on us last year. Represent your country at the worldwide Seedstars Summit in front of an international audience. Join the close knit Seedstars Family of talented entrepreneurs in 65+ countries. Find potential partners and business opportunities through the community and at the various events. We hand pick top-quality mentors from all over the world with experience in relevant industries. Benefit from the knowledge of corporate leaders, serial entrepreneurs, accelerator directors and investors. Thank you. Very useful write up!